WHERE TO USE: Lawns, Landscapes (Ornamental and Flower Gardens) and Around Home Foundations (Perimeter Treatment). ON LAWNS: Using a rotary or drop spreader designed for application of granular materials, uniformly apply product over lawn at appropriate rates listed in table. Reapply as needed. LANDSCAPES (Ornamental and Flower Gardens): Using a handheld spreader, apply evenly over area at appropriate rates listed in table. Reapply as needed. HOME FOUNDATIONS (Perimeter Treatment): Using a handheld spreader, evenly apply a 2 ft wide band next to the home foundation. Apply around all landscaping adjacent to home. Apply evenly over area at appropriate rates listed in table. Reapply as needed. 0.5 lb/1,000 sq ft See spreader settings below. 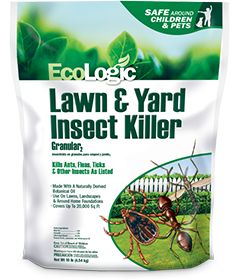 Beetles, Crickets 2 lb/1,000 sq ft See spreader settings below. Cockroaches, Palmetto Bugs, Ticks 4 lb/1,000 sq ft See spreader settings below. Armyworms, Cutworms, Sod Webworms 4 lb/1,000 sq ft See spreader settings below. water in granules after application. Storage: Reclose bag tightly after each use. Store in a cool, dry area inaccessible to children and pets. Disposal and Container Handling: Nonrefillable container. Do not reuse or refill this container. If empty: Place in trash or offer for recycling if available. If partly filled: Call your solid waste agency for disposal instructions. Never place unused product down any indoor or outdoor drain. CAUTION. Avoid contact with eyes, skin or clothing. Wash thoroughly with soap and water after handling, and before eating, drinking, chewing gum, using tobacco or using the toilet. Prolonged or repeated skin contact may cause allergic reactions in some individuals. Have the product container with you when calling a Poison Control Center or doctor or going for treatment. You may also contact 1-800-923-3623 for emergency medical treatment information.